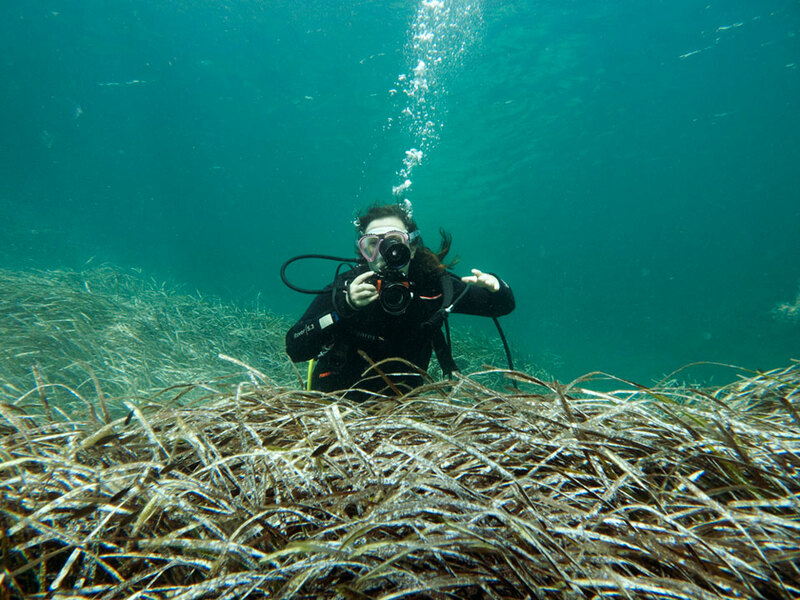 Rachel Sussman photographing sea grass off the coast of Spain. At 100,000 years old, the Posidonia sea grass meadow was first taking root at the same time some of our earliest ancestors were creating the first known “art studio” in South Africa. It lives in the UNESCO-protected waterway between the islands of Ibiza and Formentera. Photograph by Robert Elmes. 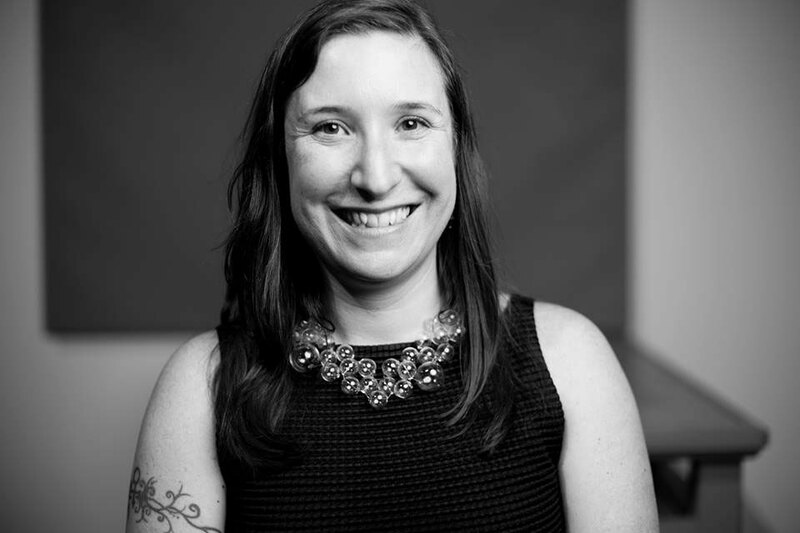 I first met Rachel Sussman when she was just beginning the project that would occupy her for a decade. The drive and long-range vision that would be required to pull it off was palpable. 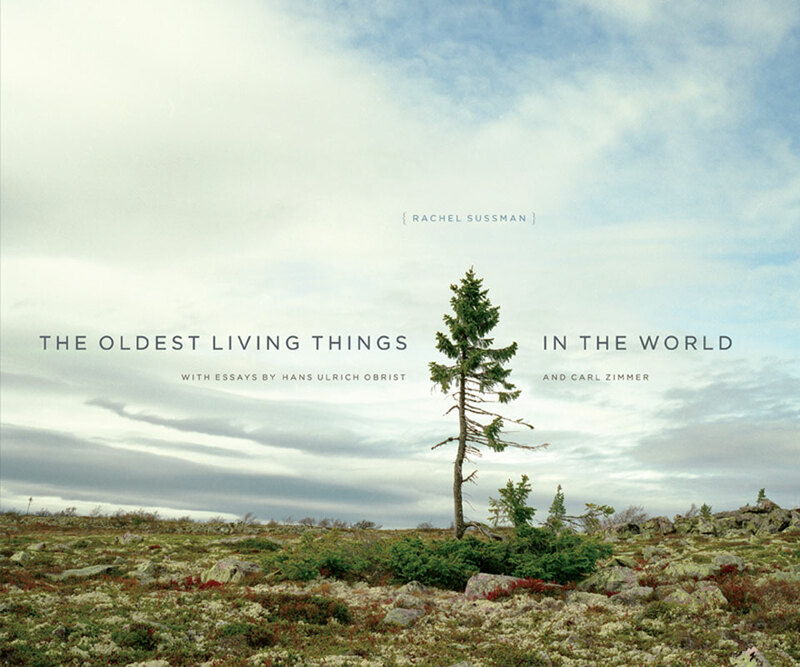 This epic commitment resulted in her recently published book The Oldest Living Things in the World, for which she researched, worked with biologists, and traveled all over the world to photograph continuously living organisms 2000 years old and older. The project has, deservedly, been garnering praise and interest from virtually all quarters, the arts, the humanities, the sciences and the general public. Stewart Brand calls her work “the missing science of biological longevity.” Fueled in equal measures by passion, curiosity and political urgency, it is a rare individual who, in our specialized age, can meld the visual and the scientific in such an elegant and accessible manner. RS: Yes, when I am writing about the Bristlecone Pines. MAD: Obviously photography is related to time, in a fragmentary way. So its interesting to use this time-based medium, that is primarily used to record the chronology of human events, to record, give evidence to refer to the longer periods, epochs that are far beyond human scale. 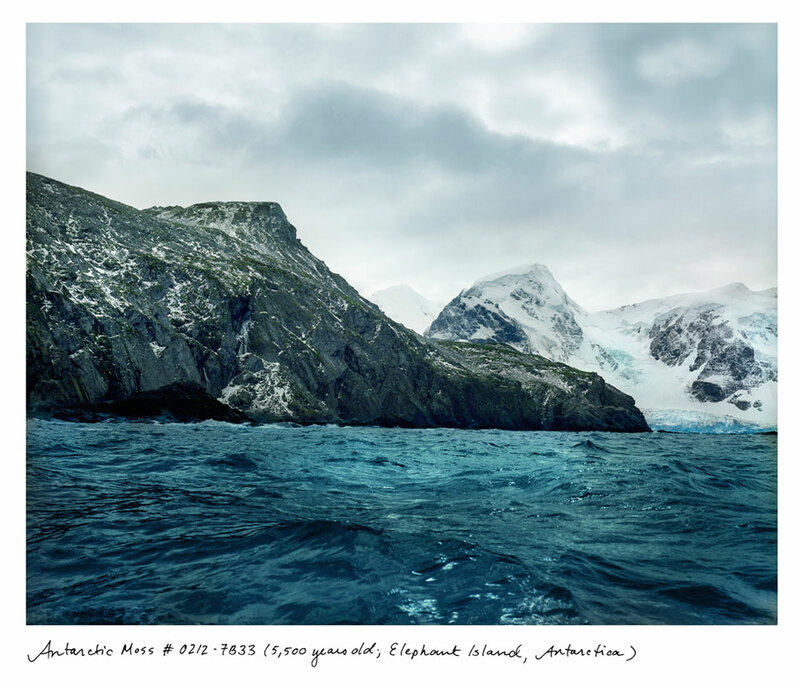 RS: That’s one of my favorite aspects of the project, the temporal tension between the physicality of what it takes to make an image; I often shoot at 1/60th of a second – this miniscule fragment of a second to photograph an organism that has been around for thousands if not hundreds of thousands of years. And it required all of that time in order to make this particular image of it. And there’s me, an organism in my 30s, both bearing witness to it and creating a record of that moment in time. There are these temporal layers meeting in that instant. The photograph and the photographic act are multilayered, palimpsests of time and content, even though they are two-dimensional. MAD: You use the term ‘palimpsest’ in your TED Talk. I’ve always been fond of that word, but I never thought about living things in relation to it. MAD: Well it prompted me to think about evidential layers of existence that might be visible not solely in inanimate layers from telephone poles covered with old posters to sedimentary layers in rock. RS: The secondary definition of “palimpsest” refers to a thing – which could be anything, really – containing layers of its own history within itself, under the surface. In some cases, such as with tree rings, the idea of living layers is quite evident. I suppose if I were a trained painter or sculptor I would find a way to address that through those mediums, but the fact that they are photographs adds an additional layer. The image records both the fraction of a second to expose the scene but also the almost unfathomable spans of time that these organisms have lived up until, and hopefully through, that moment. MAD: That’s why people like time-lapse photography because it gives a sense to time that we do not experience. Perhaps I am being redundant but the paradox between the photographic fraction and organic longevity, a time far beyond photographic time is a conceptually dramatic aspect of the work. 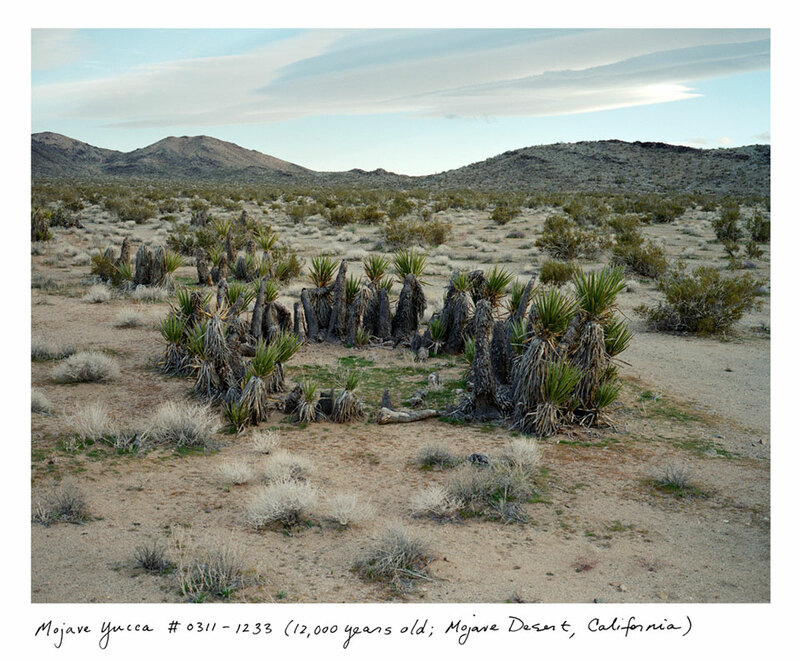 The approximately 12,000-year-old creosote bush and Mojave yucca both have remarkable circular structures, pushing slowly outward from a central originating stem. New stems replace old ones, but they are all connected by the same clonal root structure. RS: Yes, I love that. It’s so hard for us to wrap our heads around the spans of time involved here. Humans do not think in that way, physiologically our brains work in a time scale that befits our biology. I sometimes use the analogy that deep time is like deep water. It’s hard to stay in deep time: you are always brought back to the surface. The photograph draws attention to that disparity; it is the window, the surface drawing the viewer to go deeper. That is also why I think of the photographs as portraits more than landscapes. These things are individuals, which is the scientific basis of the project, everything pictured is a continually living organism. To anthropomorphize them is a way to connect with abstractions empathically. MAD: That’s an interesting distinction – thinking of them as portraits more than landscapes. I was thinking about your pictures in relation to the history of the sublime. To put it crudely, your pictures don’t have the conventional markers of the sublime such as a theatrical composition or perspective to induce contemplation. They are not broadly about an overwhelming beauty or creative force; instead your pictures have everything to do with the specificity of the individual organism. RS: The sublime here is in the mind’s eye, you are right that they are not heroic landscape images, although there are a few landscapes in the project for context. I set out to show these things as they are rather than attempt to glorify them in an additional way. I mean, some of them enter that territory, when you walk among the giant sequoias one is humbled. But so many of the other organisms are so diminutive you wouldn’t even notice them, like some scraggly little underbrush that happens to be 13,000 years old. So you have to know that information – that is where the layering comes in – you have to have the facts about the extreme age and have a moment to take it in and process it. It’s a conceptual moment, as opposed to a purely visual one, that hopefully leads to a sublime experience. Rhizocarpon geographicum, commonly known as map lichen, live in cold, sometimes elevated regions free from air pollution. 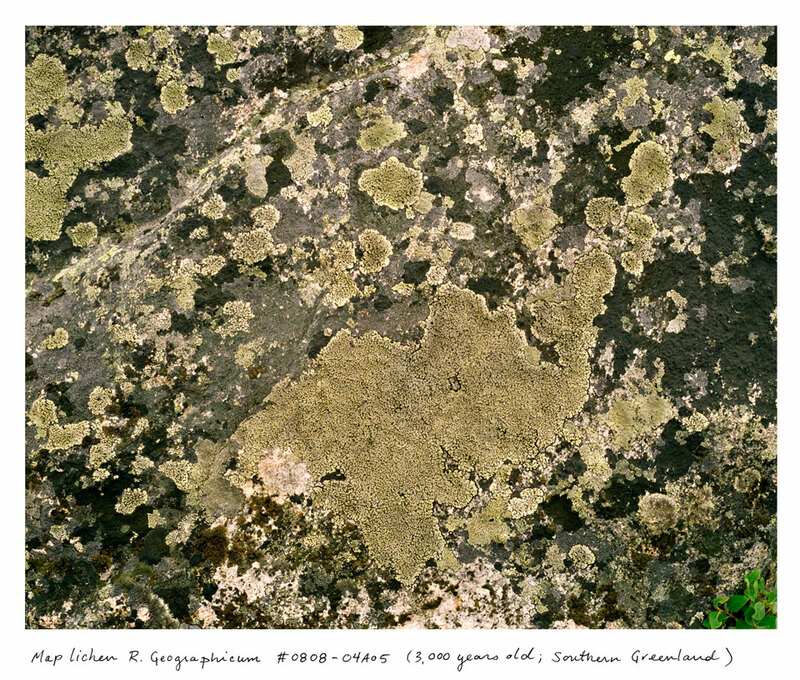 Fields such as archeology and climatology utilize “lichenonmetry”, or the measurement of lichen growth based on known growth rates, to determine the ages of exposed surfaces they grow on, including Norse ruins found in Greenland. MAD: Like the lichen, it grows some miniscule amount. RS: A centimeter every hundred years! That is my favorite statistic. MAD: So there is a modesty of scale but a kind of grandeur in terms of time. Something so humble has incredible strength and longevity. RS: This is one of my favorite organisms in the project for a variety of reasons. One is that continents are drifting away from each other faster than this lichen is growing. The common name for this lichen is ‘map lichen’ and some were sent into outer space by astrobiologists in order to do experiments around the idea that life could have started elsewhere in the universe, possibly reaching earth by piggybacking in on meteorites. The map lichen were taken to space and exposed to space conditions and they returned completely healthy and intact. So they are not only connected to geological time but also cosmological time. The same is true for the stromatilites in Australia, which are part biologic and part geologic – they also happened to oxygenate the planet three and a half billion years ago. Those kinds of time scales are mind blowing, and this comes back to the reason why I framed the project around organisms that were 2000 years old or older. My joke is ‘Why is it 2014 right now? Its really 4,500,002,014.’ We have living presences among us that are connected to the dawn of time on earth. 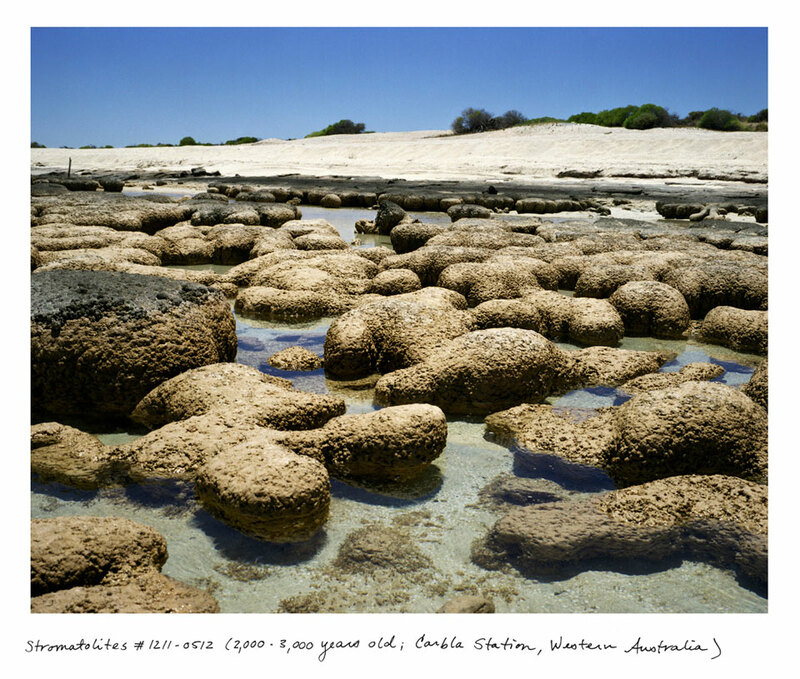 Straddling the biologic and the geologic, stromatolites are bound cyanobacteria; organisms that are tied to the oxygenation of the planet that began 3.5 billion years ago, setting the stage for the rest of all life on Earth. MAD: Did you every read Italo Calvino’s Cosmicomics? It’s a series of short stories in which Calvino imagines creation from the Big Bang until now. He creates characters representing abstractions such as Oort Clouds in order to portray specific cosmological and evolutionary concepts. I think you share some interests with Calvino in terms of trying to represent phenomenon far beyond human scale. RS: I haven’t read the work as a whole, but some friends of mine—also artists—recently shared his story about the moon with me for the same reason. I’ll have to put the rest of the collection at the top of my reading list. MAD: The goal is to find a form, an accessible form, to communicate deeply philosophical ideas that challenge our limited perspective, not to make us feel insignificant or diminished necessarily, but rather that we are part of something beyond our own finiteness. RS: That’s true for me, absolutely. I remembered recently that I had an experience when I was maybe 8 or 10 years old, everyone in my family had gone to bed and for some reason I was still up, sitting in the dim living room looking at a really big atlas which contained images of the solar system. I had a visceral reaction; I understood for the first time that I was part of bigger universe. We need a story, an entry point to connect to that vastness. The same applies to the abstractions of climate change, to list carbon dioxide levels is one thing, to see it visualized brings it closer to reality. MAD: That connects to the image used on the cover of your book. This tree is experiencing stress; it has existed for thousands of years far from human habitation yet it is suffering from the effects of human behavior. 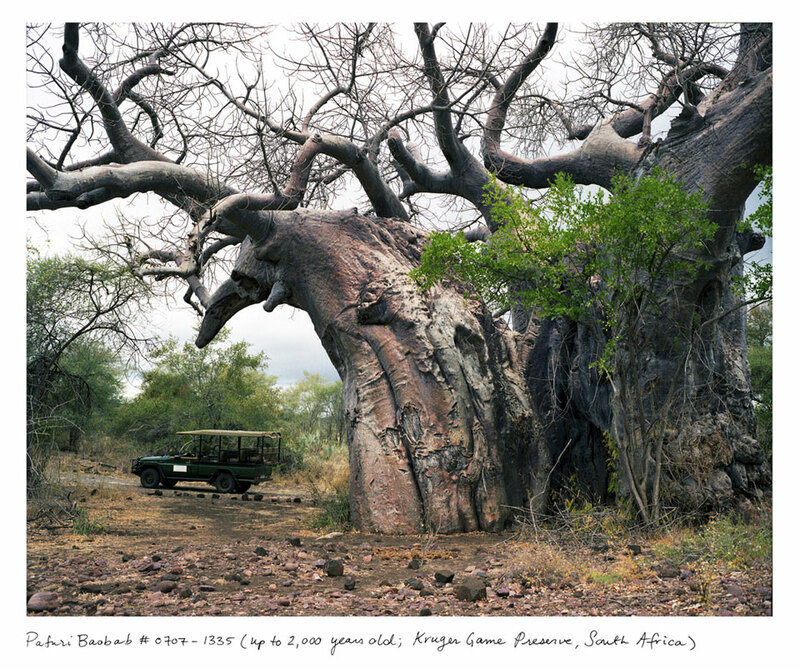 The tree then, functions as a kind of sentinel, it functions symbolically and literally. RS: Yes, I sometimes refer to that picture as a portrait of climate change. Once you know the science behind it, you can read the story of climate change in that tree. That scrubby mass of branches at the bottom has been growing that way for 9,500 years, roughly at the relatively constant snow level at the top of this plateau. But in the last 50 years a tall, spindly new trunk has grown because it has gotten warmer, so the tree has adapted a new growth strategy. It’s hard to believe that is a good idea after it has been so successful for almost 10,000 years previous. The more it invests in that single, tall trunk, the less it has to invest in the other, low-growing limbs. MAD: Most of the organisms in the book are represented by more than one image. What is that choice about? Does it go back to the portrait versus landscape? RS: I think I was trying to get to know them as individuals through the act of photographing them. In many cases there isn’t one definitive shot that could tell the nuanced story I wanted to tell; sometimes I chose to include close up shots alongside more establishing images in service of narrative. The Palmer’s Oak in Riverside California for example (the scientist who discovered it contacted me and said ‘Hey, why isn’t our tree in your project?”) It is perched atop a rocky hillside, where on one side you have this very primal landscape, and if you approach it from the other, it’s completely strewn with garbage, old couches, and tar shingles, apparently meth dealers dumped old labs there. It’s just a mess. In the middle of that, you have this Palmer’s Oak – a 13,000-year-old tree – which existed when there were still mastodons and saber-tooth tigers roving Southern California, and now looking down upon this industrial wasteland of Riverside. These are all elements in the story of this organism, which couldn’t be encapsulated in a single image. 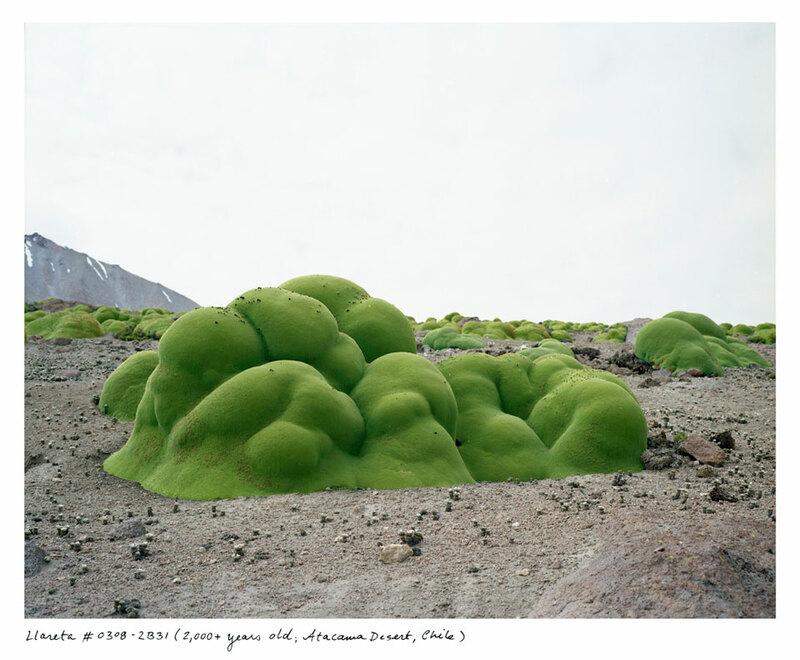 This 5,500-year-old moss bank lives right around the corner from where the Shackleton Expedition was marooned 100 years ago on Elephant Island, Antarctica. It was a victory simply being able to locate it. These days it’s easier to get to Antarctica from space. MAD: I like how you trust the image to communicate on a deep level. While it’s not directly related, I spent the entire afternoon yesterday in one room at the National Gallery of Art in D.C. This room contains a painting of Saint Lucy, from which I got the logo for my website. It is the most obscure and least visited gallery at the NGA and contains, at first glance, a handful of minor early Renaissance paintings. I decided to write an essay about Saint Lucy and her neighbors, all of the images that hang in the same room with her. What was extraordinary is that the longer I spent in that room, the deeper it got and the happier I became. My experience of time was altered in some subtle but significant way. There I was standing in front of 500 year old paintings that illustrate a faith I don’t believe in yet understood them not merely as pictures but as living presences. You have to give it time for the time to come back transformed. RS: I think that’s completely true. I certainly felt that in making this work. I had a similar experience at the Hiroshi Sugimoto show at the Metropolitan Museum of Art 18 years ago. The rooms filled with his seascapes in particular that had me entranced, especially the nighttime seascapes since you have to adjust your vision to be able to see them at all. They are simple in their conceit but luminous in their presence. Taking the time and patience to really sit with them is richly rewarding. I am hoping that with the ‘Oldest Living Things’ pictures that you can ‘get’ the work at the surface level, but that deeper engagement will give back more and more. I am also fighting a certain convention around ‘nature’ photography or the traditions of landscape. I wasn’t waiting for the one ideal moment when the light was perfect. . I was there when I was there. I did not camp out and wait for the dramatic thunderstorm to break over the canyon. The Welwistchia is primitive conifer living only in parts of coastal Namibia and Angola where moisture from the sea meets the desert. Despite appearances, it only has two single leaves, which it never sheds. 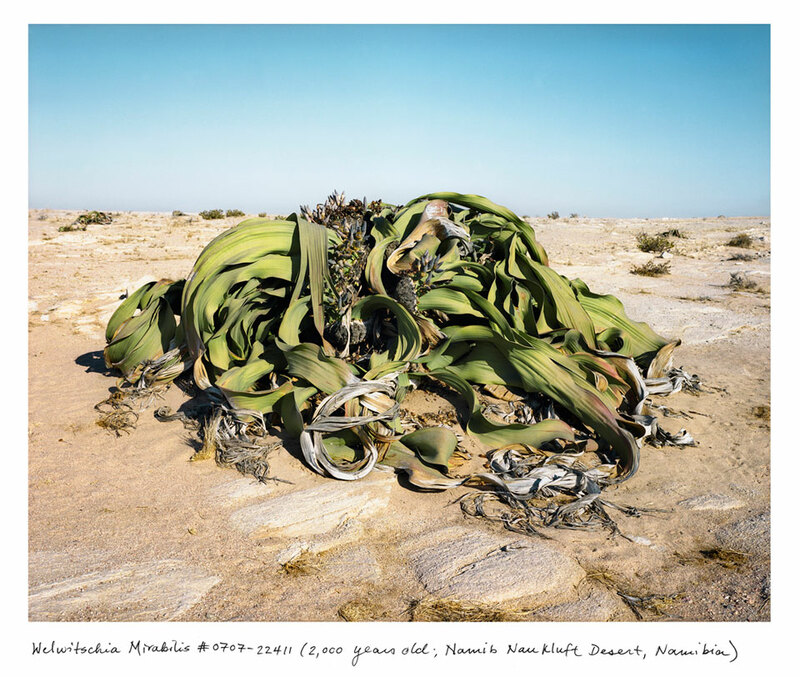 It is the National plant of Namibia. MAD: I sense sympathy with Taryn Simon’s work, particularly ‘An American Index of the Hidden and Unfamiliar’. RS: Yes, her projects and her methods resonate with me tremendously – namely the extensive research and gaining access to obscure locations. Her writing is just as important as her images; her approach in that book is encyclopedic, dry and direct. I appreciate her work as contemporary conceptual practice. MAD: An artist always carves their own path of course, but in a project like yours, involved as it is in geography, topography, biology, and climate change, just to name some of the major themes, one becomes a kind of unique expert on the relationship between all of these concerns. RS: I started this work thinking I was going to collaborate with an evolutionary biologist, but they all claimed not to be qualified because their expertise lies in narrow sub-specialties, and not in the big picture. There is no area of the sciences that deals with longevity across species. I find that kind of mind-boggling. I understand why, namely because the species are so different that study cross-species longevity seems too broad, but at the same time, to not look at that is to ignore vital aspects of the interconnectedness of life. So I ended up having to take the lead. Artists have the advantage of being able to construct their own parameters in which to work. But you also hint at something that is really important to me, which is the philosophy underlying the investigation as a whole. It’s not just the biology, but rather the intersection and layering of these seemingly disparate disciplines where things really get interesting. MAD: I am reminded of the work of my friend and colleague Jane D. Marsching, who has made work around sustainability for quite a while. She was a resident artist at the Blue Hills Observatory, the oldest weather observatory in the country. She has also worked with glaciologists, helping to image the massive and rapid loss of glacier brought about by climate change. I just admire her so much. Her work is deep and smart and while the work itself is not full of despair, the things it suggests are pretty depressing. I heard her speak recently and someone in the audience asked her about that and she said the most remarkable thing, that she had decided that she was going to try to love a dying planet. MAD: How do you deal with the implications of your work? RS: I’m really worried. Climate change is an emergency in slow motion. I feel like we are at the 11th hour, but that it’s not too late. I was recently doing some work at the NASA Jet Propulsion Lab in California and they have just launched all these new Earth missions, all of which deal with different makers of climate change, whether it be carbon dioxide levels, ocean level rise and acidification, and so on. The news is not good and yet I am glad that we have our best minds working on it. I am a cautious optimist but now is the time for action. I am hoping that my work can contribute to rethinking and reimagining what we are doing as a species on this planet. I hope that by helping to forge a personal connection with our planet’s oldest residents can lead to a change in perspective and ultimately in behavior. MAD: Artists are often criticized for being vague generalists or dilettantish about knowledge, but actually that can be our strength, that we can and will embrace and investigate just about anything without regard to what’s proper. RS: Yes, too many experts get trapped in these disciplinary silos and rote methodologies and cannot or will not get out of them. Even in the sciences, so many of important discoveries were made not by the primary investigator but by someone involved peripherally and sees the research from another perspective. MAD: How do you know where to look for your subjects? RS: A whole lot of research and a healthy dose of kismet. I found out about those ancient bacteria at a New Year’s Eve party of a painter I knew from the MacDowell Colony. I was introduced to a scientist from MIT who was on the team that discovered the bacteria. MAD: Artists and scientists at the same party? That is unheard of, I have to hang out more with you.